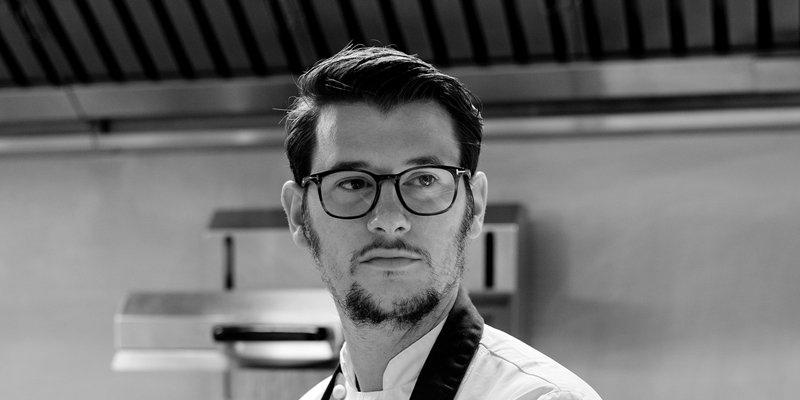 With countless awards to his name and an ever-growing empire of restaurants, Adam Handling has achieved a huge amount in his illustrious career. Taking inspiration from his travels around Asia, utilising modern cooking techniques and sourcing the best of British produce results in flavourful dishes full of playful twists and theatre. Drive, hard work and ambition – three things every chef needs to succeed in a notoriously difficult industry. You have to put up with brutally long working hours; constantly strive to be better than yesterday and soak up as much knowledge as you can. And while there are many role models that encapsulate this in the world of hospitality, few can hold a candle to Adam Handling, who has a plethora of accolades and a restaurant empire to his name. Not bad for a thirty-year-old; especially one who only started cooking so he could escape school. 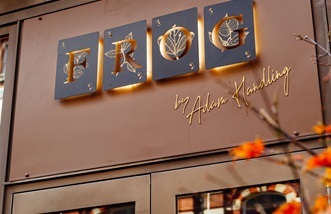 Frog by Adam Handling enjoyed the same success as The Frog E1, offering a slightly more fine-dining-focused experience (although it’s still representative of his relaxed, contemporary style). The two worked in tandem until the lease ran out at E1, which meant Adam had to find a new site. Rather than a hindrance, this gave him the opportunity to take the essence of The Frog E1 and move it into a bigger site in Hoxton – just a leap away from his Shoreditch base. He took stock of all the mistakes he’d made when opening his first restaurant (which was done incredibly fast and saw the kitchen team helping with everything from painting the walls to attaching door handles) and learnt from them. Adam has now proved that he’s not just an incredibly ambitious and talented chef; he’s a dab hand at opening and running restaurants, too. Whether it’s fine dining tasting menus, bar snacks and cocktails, zero-waste deli lunches or room service for a world-class hotel group, he has it covered. While he’s yet to get a Michelin star – something he says he’d love to get but certainly isn’t chasing – he's won a whole host of other awards that prove Adam is a chef at the top of his game. And a meal at any of his establishments is testament to that. Having a variety of restaurants means Adam can implement a zero-waste policy across his empire. Prime cuts go to Frog by Adam Handling; secondary cuts go to The Frog Hoxton, and anything leftover at the end of a service is turned into delicious limited-run dishes at Bean & Wheat. Adam’s signature dish is a plate of celeriac, truffle and apple called ‘Mother’ (a tribute to his mum after she told him she’d decided to become vegetarian), which can be found on the menu of all his restaurants. Adam worked with bartenders Matt Whiley and Rich Woods to come up with the cocktail list at Iron Stag, in a bid to make whisky more accessible. 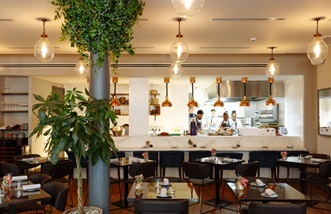 Adam Handling's flagship restaurant in the heart of Covent Garden seamlessly combines flavour, theatrics and invention on every plate, with a curated menu that reflects the personalities of the kitchen team.